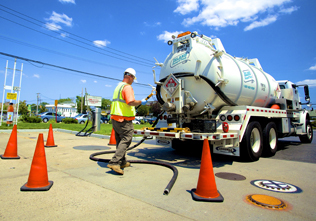 Island Pump & Tank has been providing Vacuum Truck services to the NY, NJ, and CT area for many decades. We have the right equipment to get the job done properly and safely. Our highly skilled Vacuum Truck operators have the proper safety training to perform the work properly and safely. All of our trucks are well maintained to ensure proper performance and prevent downtime. All of our employees are equipped with iPads which have their assignments on there. Leading the industry with technology, our techs are GPS dispatched to emergencies. Our fleet of over 160 vehicles all have GPS tracking on them. In case of emergencies, we know who is in the vicinity to respond, so your station or facility has minimal down time.